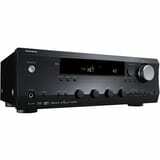 Optimize your speaker’s music playback with this Integra network stereo receiver. Its dual-band Wi-Fi and Bluetooth connectivity let you stream audio wirelessly from different sources, and it has four HDMI inputs to support high-definition A/V components. The 384kHz/32-bit high-grade digital-to-analog converter of this Integra network stereo receiver provides faithful reproduction of high-resolution audio.